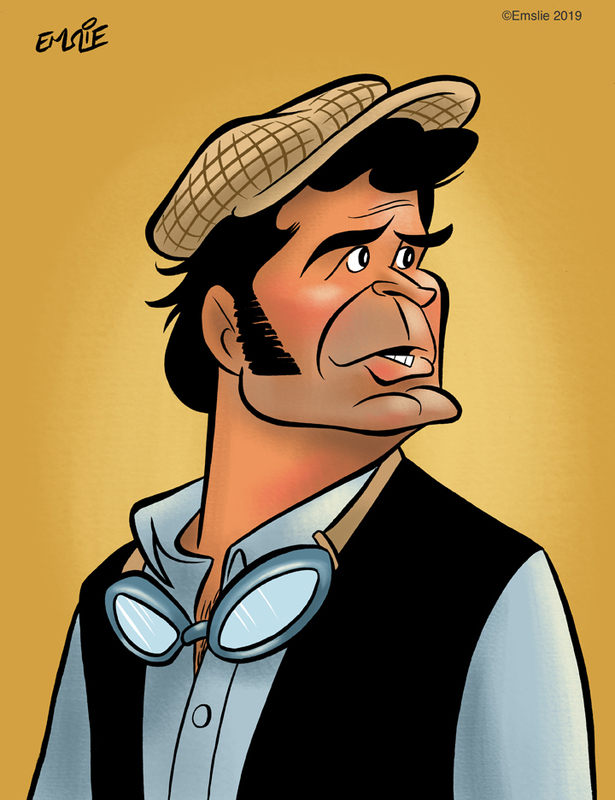 As is my annual tradition here on The Cartoon Cave, I have created a new caricature to honour my favourite actor, James Garner on the anniversary of his birthday. This time around I decided to portray Jim in his role from his lesser known TV series, Nichols, which ran on NBC in the 1971/1972 season. This was a series that I had never seen in its initial run, nor had I ever found it available in syndication since that time, so I was entirely unfamiliar with it until several years ago when it was released on DVD. Fact is, I've only gotten around to watching the series in the last few months, and am only about a half dozen episodes in, so I certainly make no claims to being an authority on the show. Although a western, it is certainly not a traditional western by any means, as it is set not in the 1800's but rather in 1914, when the automobile was first arriving on the scene. After a stint in the army, Nichols arrives back in the fictional border town of Nichols, Arizona, which was named after his grandfather who founded it. The town is now being run by a rather unsavoury clan called the Ketchams, and after some run-ins with the bullying, corrupt son, Nichols finds himself coerced into reluctantly accepting the position of sheriff by the family matriarch, a sly ol' gal called Ma Ketcham. By the third episode, Nichols has imported an early motorbike, which he tools around on in lieu of a horse in his pursuit of lawbreakers. 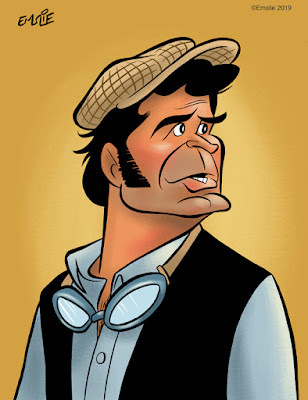 When doing so, he often wears the cap and goggles pictured in my caricature in place of his more standard cowboy hat. James Garner had high hopes for Nichols and was disappointed that it didn't catch on. I must admit, from the episodes I've watched thus far, though very good, they just haven't appealed to me in the same way as The Rockford Files had. But I still need to finish watching the series before I can make a final judgment! The series did have the distinction of being an early role for the actress, Margot Kidder, before she would go on to great fame through the Superman films. It also introduced the pairing of Stuart Margolin as a shifty deputy to Garner's sheriff, which would be a chemistry they would enjoy to much greater effect when Margolin became the equally shifty Angel Martin in The Rockford Files. I loved the show during it's original run when I was in high school - watched the DVDs a couple of years ago and didn't feel the love again, other than Garner who is enjoyable in anything. Wanted more of Kidder. It ends interestingly since Garner got advance word of it's non-renewal. I'm only a half dozen episodes into it, so it's too soon for me to have a firm opinion on the series yet. When Jim's wearing his cowboy hat, it sort of feels like the show is an extension of his film, "Support Your Local Sheriff". I do like Stuart Margolin's character, Mitch, as it hints at his later legendary portrayal of the weaselly Angel Martin in "The Rockford Files". I haven't seen enough yet of Margot Kidder to know much about her barmaid character. I know Jim Garner stated it was his favourite series, but so far it doesn't come close to "The Rockford Files" in my opinion, nor to "Maverick" either. But I need to see it all! I remember watching and enjoying the series when it was first run. I was in elementary or junior high so I wonder how it would hold up if I watched now. Love your art for the show!